The first Dreamland Recordings event for 2011 is an afternoon of sweeping atmospheres and delicate songs. Presenting a small, varied taste of Melbourne music and sound art. SASKIA SANSOM her music is ethereal, powerful, intimate yet lonely. Having recently finished recording her debut LP with legendary drummer Jim White (Dirty Three, Smog, etc), Saskia draws comparisons to Catpower, Mazzy Star and PJ Harvey, yet her haunted and fragile delivery is a sound all her own. MYSTIC EYES Lisa MacKinney has a deep appreciation of the harmonic subtleties of drones, layering, non-standard tunings and overtones, and especially their application to electric guitars and rock. Armed with only electric guitar and Ace Tone organ (with some drum loops) as Mystic Eyes she creates semi-improvised psychedelic drone epics. DARK PASSENGER is the alias of Zac Keiller. When not writing solo guitar songs under his given name or with band, he can be found improvising long slabs of dense guitar and Theremin drones with little regard to the final outcome. Dark Passenger is unhinged fun, a sonic mess that falls somewhere between ambient, drone and noise music. No pre-conceptions, no post production. Whatever happens is what you witness. 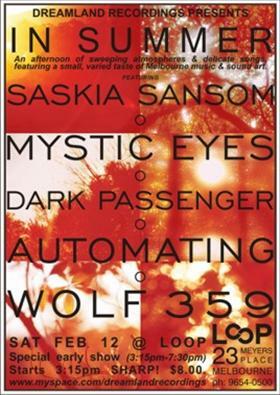 AUTOMATING is Sasha from Melbourne, Australia. Sifting through the sonic waste and discarded technology left by the roadside of a world speeding too fast into the future. Field recordings, found sound, tape manipulation, noise and effects units. Currently pursuing live and studio created binaural soundscapes and archaic tape based drones. WOLF 359 evolved from several bands located in the industrial wastelands of Westall and Springvale south-east of Melbourne. Wolf 359’s music contains elements of modern dance beats, 80s styled minimal synth punk, and twisted metallic experimentation with a static, chaotic and often beautiful disposition.